Are you ready for a super easy Halloween costume idea?!?! 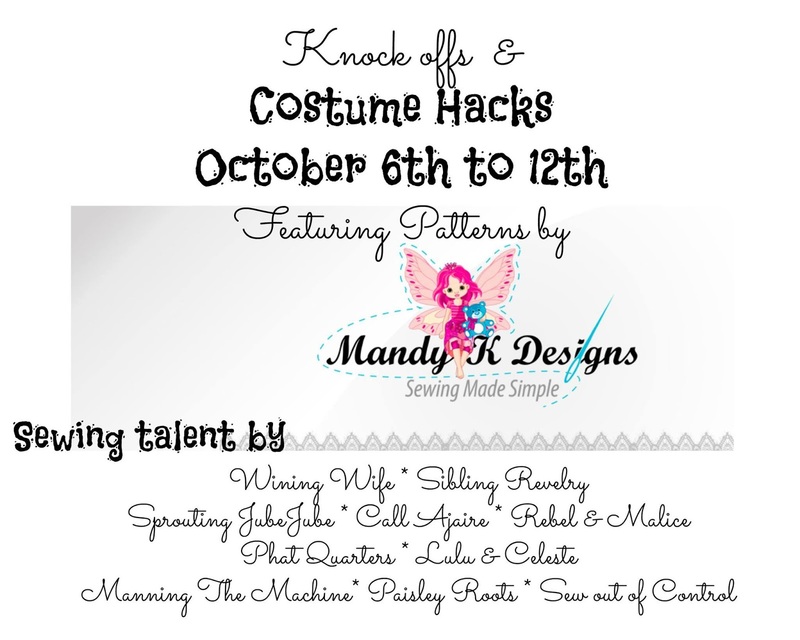 Mandy K Designs asked if I’d like to take one of her patterns and either do a costume hack or a knock off look and with Halloween coming up I thought a costume would be fitting. 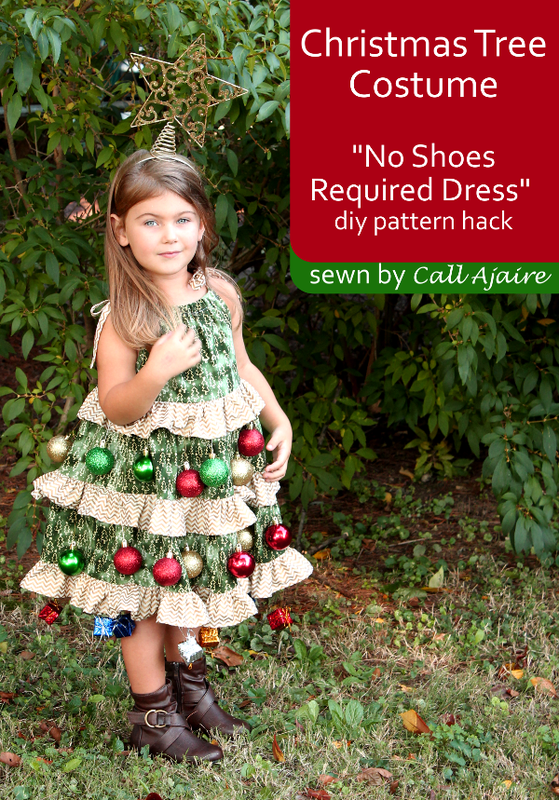 The No Shoes Required Dress is what I chose for this Christmas Tree costume hack. It’s swingy layered style makes it the perfect backdrop for adding bobbles and ornaments. The best part is that I didn’t need to make any changes to the dress pattern itself! I followed the super detailed instructions to a T and using some fabric I had in my stash meant I didn’t have to spend any money on the base of this costume. The Christmas Tree fabric I’ve had for ages as I used part of it for a (real) Christmas Tree skirt years ago. 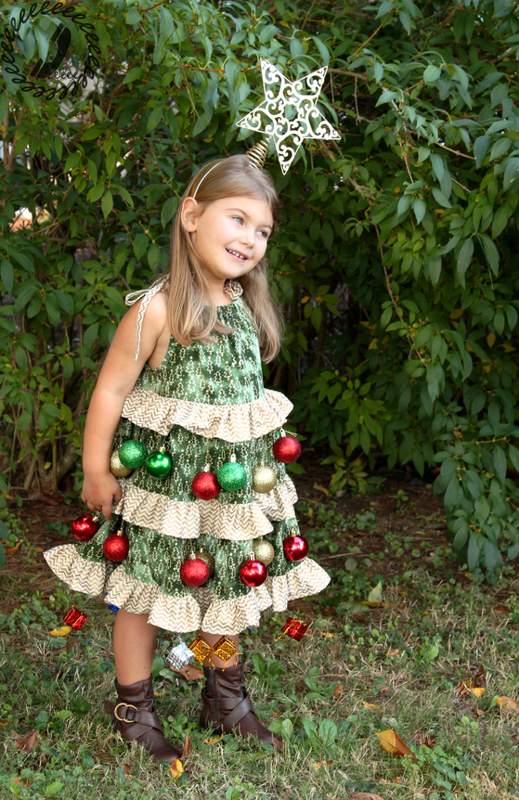 I added the gold chevron fabric (from JoAnn last year) for the ruffles to serve as “garland” on the tree. 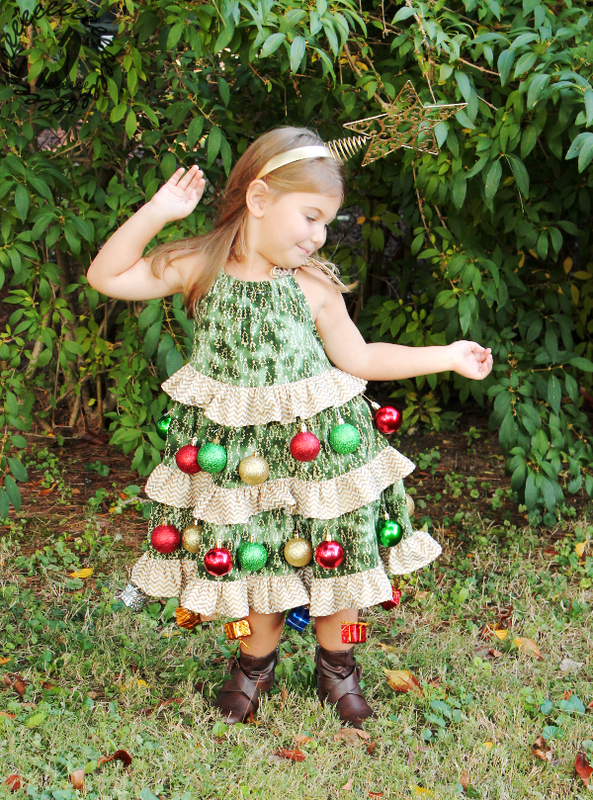 Once the dress was made, I took a quick trip to the dollar store to pick up the rest of the Christmasy bits: three tubes of plastic ornaments, one package of mini present box ornaments, and a star tree topper. I used safety pins to pin the ornaments to the ruffles from underneath and the tree topper slid right onto a gold headband we already had. It stayed on just fine for the pictures, but if she was wearing this costume out for trick or treating I’d hot glue it down. If the weather was colder, a brown pair of tights and a green long sleeved shirt would do the trick. Bean loved wearing this costume, but of course she has grand plans of a totally different costume this year, hehe. 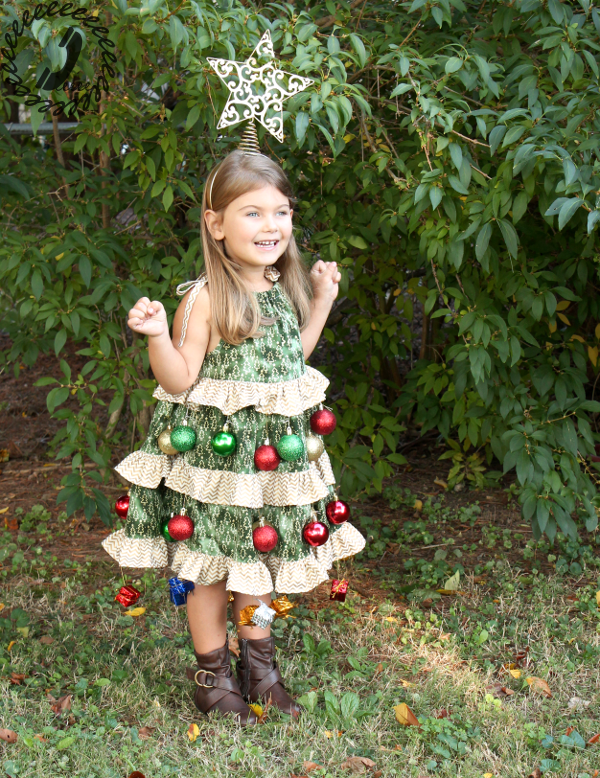 The good news is that since everything extra is just pinned on, the dress without the dollar store items would be perfect for a school Christmas party or just for wearing around the holidays. The tie straps make it easy for layering. Pretty much nothing could stop her from dancing and twirling in that dress. 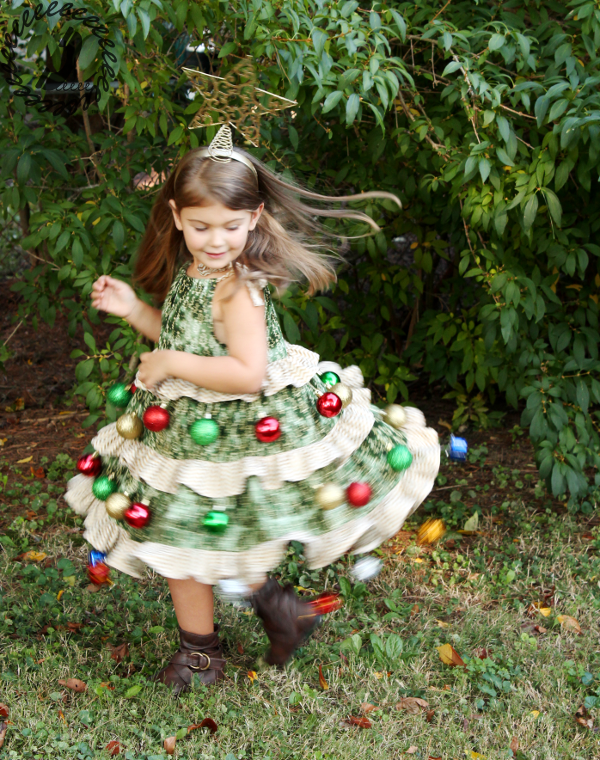 The weight of the ornaments practically begs for twirling, so as a costume it’s a big win! Another win is that this pattern is offered FOR FREE on Mandy K Designs! If you’d like one of her other patterns, you can use the coupon code MKDblogtour2015 for 30% off through October 11th. 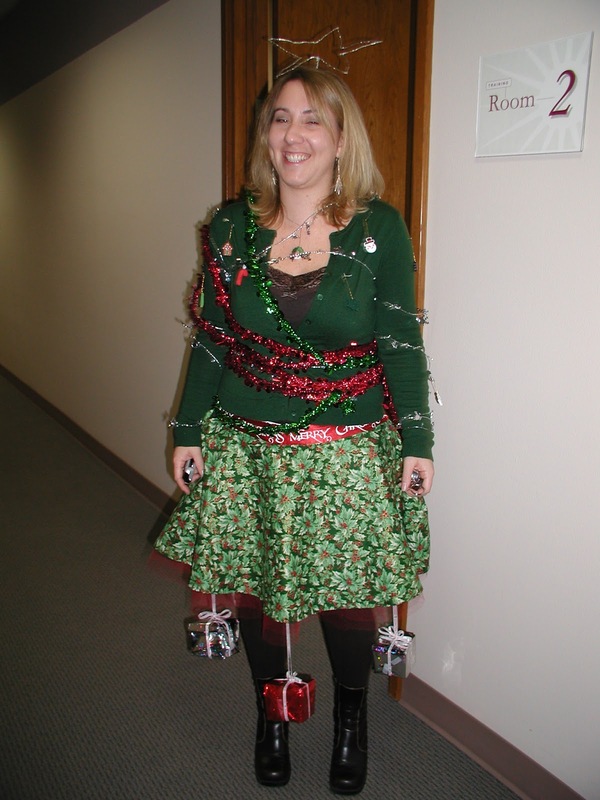 Now in case you were wondering where I came up with the idea of a Christmas Tree costume, I dragged up this picture from (I think) 2005 where I dressed as a Christmas Tree for work. I was a programmer at the time, there was a Halloween party we were supposed to dress up for, and there’s a terribly geeky Computer Science joke referencing Halloween and Christmas so it was fitting. I made a “tree skirt” with a working zipper and everything, hehe. I have to say, Bean’s costume is a lot better and took less time to make. Now I can’t promise there will be any other embarrassing pictures from 2005 on the tour, but I DO know you don’t want to miss these other looks!